An emergent meeting on road safety, traffic management and observance of the road safety week in Kokrajhar district was held today under the president ship of Kokrajhar Deputy Commissioner Bibekananda Choudhury in the conference hall of the DC’s office here. Expressing concerned about rise on the vehicular accident and traffic problem in Kokrajhar, the DC asked the DTO and PWD(Roads) Executive Engineer to engage their officials to identify vulnerable points and speed breakers which are not as per the government norms and take immediate action to address the same. The meeting was also discussed about the traffic problem in Kokrajhar town and measures to be taken upon it. In this direction, he asked the traffic police in charge to make time schedule subject to time to time change in view of regularising plying of vehicles as on which routs and what times the particular types vehicle should ply within town area. During the discussion, issue of increasing number of e- rickshaws in Kokrajhar town and their registration under motor vehicle act in the DTO office was also discussed and accordingly the DTO and traffic police incharge were directed to take action on the issue. 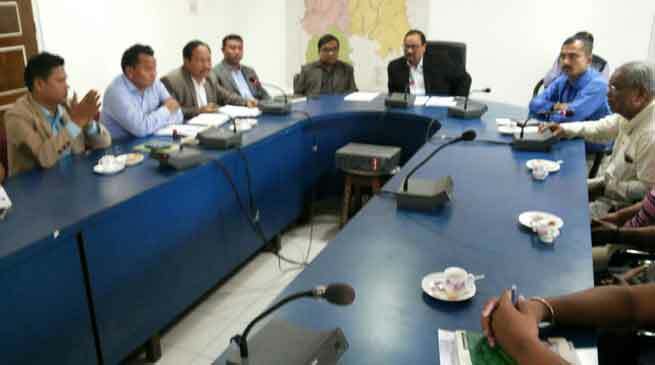 The Kokrajhar District administration has decided to observe the 28th Road Safety Week this year in befitting manner from January 9 to 15 with various programmes like pestering, erecting banners, mobile announcement on road safety, road checking, holding of awareness camps at schools and colleges, eye camp at Suman Petrol Pump, street corner meetings, taking out processions by the bus, truck, taxi owners, drivers, handymen and transport officials in Kokrajhar town from Indian oil to DC office etc.